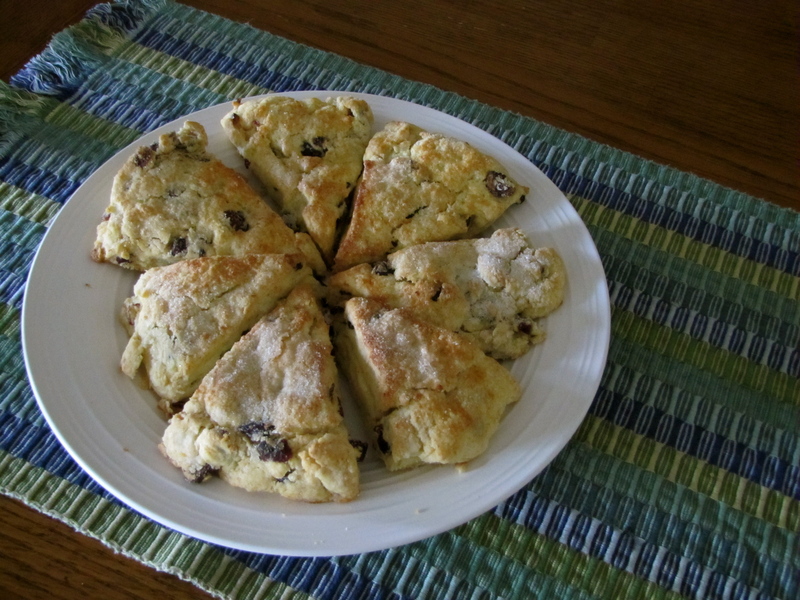 Cranberry Orange Scones – Voila! Cranberry and orange. Don’t those smells, colors and fruits just yell “AUTUMN!” Of course, there is pumpkin, pecan, turkey and other sweet and savory delights. However, today we’re focusing on this particular fall delight of cranberry and orange scones. These scones are not too buttery, not too dense, just right. Scones, like most baked goods, are best when they’re warm from the oven. They make your house smell great and pair wonderfully with some hot apple cider. Lessons learned: I actually forgot to put in the 3 T. of sugar but they still turned out really good. In the cookbook, the author’s say that in grand ol’ England, traditional scone recipes only have 1-2 T. of sugar anyway. So instead of mixing the sugar in with the batter I just sprinkled a couple tablespoons over the top before baking. Pick your choice, but I think they might be even better without the sugar since they won’t be as sweet. You can always add marmalade or lemon curd. 1. Place flour, baking powder and salt in the bowl of a food processor fitted with a metal blade. Process with six 1-second pulses. 2. Remove cover and add butter pieces and orange zest. Pulse until the mixture resembles coarse meal with some larger buttery clumps, about twelve 1-second pulses. Add cranberries and quickly pulse another 1-3 times. Transfer dough to large bowl. 3. Stir in heavy cream with a rubber spatula until dough begins to form. 4. Transfer dough to a lightly floured workspace and knead by hand until it comes together in a sticky ball. Press the dough into an 8-inch cake pan. turn the dough out onto your workspace and cut into 8 wedges with a sharp knife. 5. Arrange scones on baking sheet. Sprinkle with sugar. Bake for 12-15 minutes, until scones are light brown. Serve warm or at room temperature.